VISHAY Intertechnology, represented in Australia by Braemac , has released a new series of wirewound, moulded, surface-mount inductors designed to eliminate electro-magnetic interference in power lines for personal computers, telecommunications, appliances, and other electronic devices. Measuring 5.6mm by 5mm with a 5mm] height profile, inductors in the IMC-2220 series serve as a drop-in replacements for industry-standard 2220 (or metric 5650) devices. Forty-nine inductance values ranging from 1.0mH up to 10000mH are available with tolerances of ±10% and ±5%. 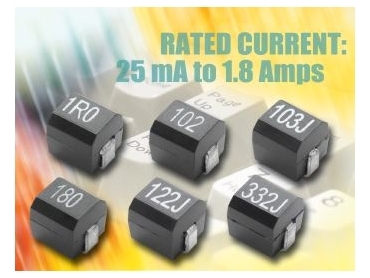 Intended for medium- to low-frequency resonant circuits, the new devices are rated for currents from 25mA to 1.8A. The series is rated for an operating temperature range of -25°C to +85°C and a storage temperature of -40°C to +100°C. The IMC-2220 devices' moulded construction provides strength, and moisture resistance, and features environmentally friendly terminations that are 100 per cent lead-free and compatible with both vapour-phase infrared and wave soldering methods. The new inductors are available in tape-and-reel packaging (400 pieces per reel) for automatic handling.